Although a popular tourist attraction in London, compassionate people do not admire the changing of the guards at Buckingham Palace. 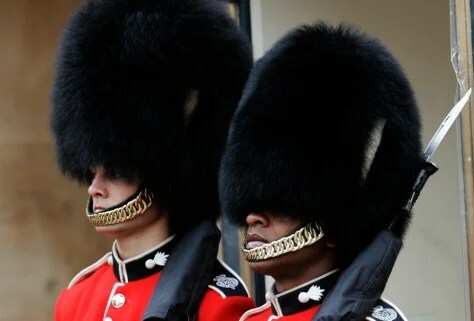 Because in the name of pomp and ceremony these guards each wear a Canadian Black Bear on their heads. The standard bearskin headgear of the British Foot Guards is “18 inches tall, weighs 1.5 pounds”. The entire skin of a Canadian Black Bear is used for each hat. The British Army purchase the hats, from a British hatmaker who sources the skins from an international auction. 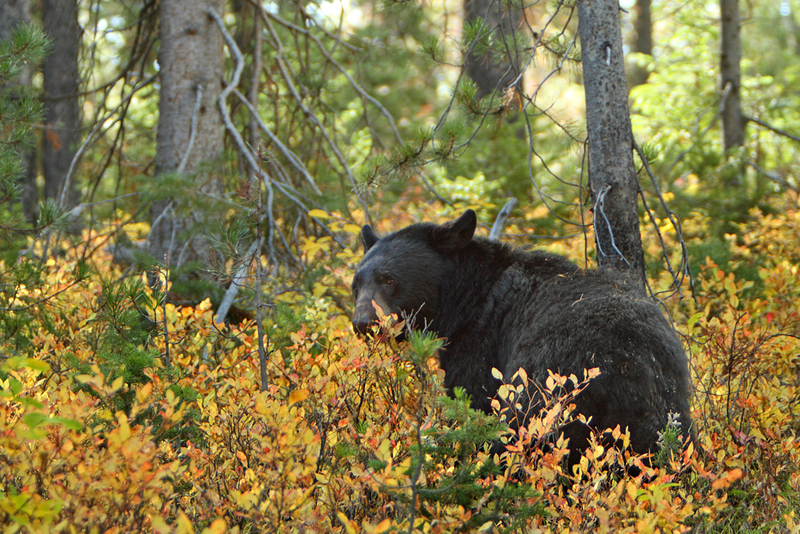 The hatmakers purchase between 50 and 100 black bear skins each year at a cost of about £650 each. Bears are not farmed but are baited and killed by Canadian hunters, who then supply the auction houses with bear pelts. 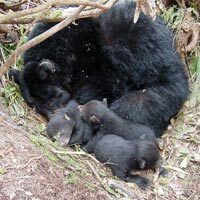 Mommy bear with her babies. Needless to say, we would rather these guards went bare-headed than clung to this cruel and antiquated tradition. If these items did not involve the use of fur or the body parts of dead animals I would find them amusing ~ the humans of course, not the items. YELLOW DYED FUR LINED HEELS FUR WINE ‘COOLER’? FUR EGG WARMER HOOF AND REPTILE SKIN SHOES. According to the Canadian fur co., “mink becomes sheared mink when the more-coarse guard-hair is sheared away leaving only the softer under-fur. Sheared mink then looks and feels like velvet”. WORDS FAIL ME! Surely if you like velvet then wear velvet, which is made from natural fibres. What Canadian fur co. fails to mention is that it is not the live mink that is sheared but the resultant fur coat, which is made up of the skins of many dead minks. They are born in captivity. Kept in tiny metal cages. Due to being kept in overcrowded, dirty, small metal cages, these creatures go insane, displaying neurotic stereotypic behaviour. These repetitive, mindless actions are not observed in minks in the wild. If the ammonia from accumulated faeces of the animals is not cleaned up, it will cause their eyes or lungs to burn. In frustration they bite each other or even self- mutilate. To increase the profit margin, the cheapest possible methods are used for killing fur-bearing animals. To preserve the pelts, minks are routinely gassed. Gas (Carbon Dioxide CO2) boxes are used on mink farms where 30 to 50 minks are shoved into one box (see below). Although 100% carbon dioxide induces unconsciousness rapidly, lower concentrations are far less effective. For example, 70% CO2 fail to kill in less than 15 minutes. Often these mink are still alive when skinned. Only once many minks are skinned and sewn together for ONE coat is that coat dyed and sheared to make it look more “modern”. In the wild, mink are semi-aquatic and need water in the form of streams or lakes. They enjoy wooded banks. Generally they are solitary and inquisitive beings except when they pair off to breed. Living and dying on a fur farm is sheer torture for minks. Only 58 % of 18 to 24-year-olds in a poll believed it WRONG to use fur! I found this dismal statistic when reading Lorraine Fisher’s article in the Mail Online – March 2014 (http://www.dailymail.co.uk/femail/article-2582226/How-fur-industry-clawed-way-Lavishing-gifts-celebs-Targeting-children-classroom-The-cynical-ploys-making-fur-respectable-again.html#ixzz3Dr13WeP8). Even more depressing, though, was realising how furriers and fashion designers are trying to lure young people into buying real fur produce. To do this, these manufacturers are moving away from the ‘luxurious, heavy’ look of fur and producing a ‘lighter, colourful and fun’ product. In other words, not only are creatures being needlessly skinned for their fur but their fur is now being disguised through dye and shearing. THIS MAKES NO SENSE TO ME. Re-imagining the idea of fur in a way to make it accessible for younger generations. Using dyes on fur to provide varied, youthful, and more modern pieces. Crafting thinner fur garments so that they can be more readily worn in warmer-weather areas. Gifting fur to celebrities to increase exposure. Targeting future designers through fashion school competitions by providing free fur garments to use. Inviting established designers to work with fur. Making and promoting educational materials about fur for use in school curriculum. This is blatant manipulation, as no information is given about the ethics surrounding fur and the industry’s inherent cruelty. As stated in the article, “Simply because fur is purported as a ‘fashionable’ fabric or a ‘luxury’ item does not suddenly make the suffering of millions of animals (over 50 million annually to be exact) okay”. The video below from the Humane Society of the United States shows that there is absolutely no compassion present in the fur industry. Children cannot make an informed choice, as I’m sure their parents do not tell them about the horrors of the fur trade. So often caring people feel overwhelmed by the amount of suffering in the world, including the abuse of nonhuman animals. Please remember that every day we can make a choice ~ about what we buy or consume ~ that will make difference. BWC makes this easier by publishing lists of products that are not tested on other species. When in doubt, look for the blue bunny. Compassion is the emotion that one feels in response to the suffering of others that motivates a desire to help (http://en.wikipedia.org/wiki/Compassion). If you are reading this post I think you will agree that it is the task of adults to raise compassionate children who will later help reduce suffering in the world. Heather does volunteer work on Saturday mornings with children from Philippi, Cape Town, South Africa. Authors of the Alcohol Development and Poverty in South Africa blog explain that Philippi is a low-income community that “faces serious development challenges in the form of poverty, unemployment, overcrowding, food insecurity, crime and exposure to environmental hazards such as flooding and fire”. These are their photos of Philippi. Heather’s input is part of the Kwafaku Reading Group project which aims to inculcate compassion through “Humane Education”, which uses story and activities as methods of learning. Although English is not the first language for these children, Heather explains,“We have covered many stories on how to look after animals and exercise compassion”. A recent topic was “FUR”! In Heather’s words this is how she approached this topic. ~ We imagined that one night we went to sleep and the following morning we awoke to discover that someone had stolen our skin!. ~ How would we feel? Imagine what animals feel when they are farmed or hunted for their skin and fur. ~ We looked at pictures of animals that do and don’t have fur; learnt that birds have feathers and fish have scales not fur!! ~ We discussed why animals have fur – to keep them safe and warm. ~ We then sang and dramatised the fur song “Don’t steal My Fur”, as shown below. ~ I read the story “How the Little Fox saved Her Coat” by Rosa Close, a charming story about how a fox rallied children to teach the elders not to hunt animals for their fur. ~ I declared a Fur Free Day to last forever! ~The children then made their own Fur Free Day posters. BE THEY RABBITS, FOXES, MINKS, RACOON DOGS ~ MILLIONS ARE BRUTALLY KILLED FOR FUR FASHION! Erich Fischer Furriers is a FUR SHOP in an upmarket mall, The Firs, Johannesburg, South Africa. 1. One whose occupation is the dressing, manufacturing and designing of new fur garments or cleaning and repairing used fur garments. 2. Furriers source their pelts from auction houses, which in turn acquire furs from fur farmers or from trapping. 3. Generally a furrier would only use fur from a fur farm to ensure “quality”. Animals that have been trapped or hunted will have holes in their pelts, which is not desirable for the furrier. 4. After the auction house, pelts go through a series of treatment steps, called fur dressing, to preserve and improve the texture of the skin. 5. The fur garment is then made up from the skins of many dead animals and sold to people who are self-centred and lack compassion. Mr Fischer prides himself on being Africa’s only fur specialist that abides by the Origin Assured (OA™) label and therefore claims that his fur produce is sourced ethically. 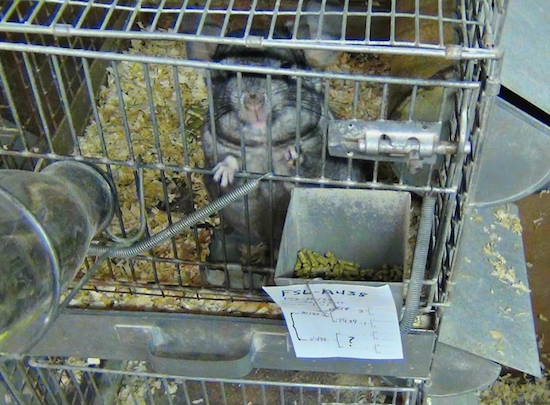 Blogger Don Lichterman @ http://sunset-daily.com/ posted this photograph below of a chinchilla bred on a typical fur farm. This life of misery is the only life chinchillas know before being electrocuted and skinned on fur farms. Up to 200 chinchillas can be used for one fur coat. In the light of this information, Mr Fischer’s advertisement does not seem so seductive, even with its OA™ label. Mr Fischer and the Firs management refer to the OA™ label to justify that the fur trade is humane and ethical. The OA™ label was launched in 2006 as a joint initiative by PRO-FUR organisations, namely The International Fur Trade Federation (IFTF), Kopenhagen Fur, American Legend Cooperative, Finnish Fur Sales (SAGA Furs) and North American Fur Auction. Displaying this OA™ label on fur items is meant to assure consumers that the fur originates from a country where animal welfare regulations or standards governing fur production are in force. Alongside Kopenhagen Furs, Saga Furs with its OA™ label is one of the biggest auction houses in the fur industry and operates from Finland. New footage from investigations done by Four Paws (UK) on three FUR FARMS IN FINLAND was released February 22, 2014, revealing shocking conditions on these farms. Of significance is that these are farms certified by Saga Furs i.e “origin assured”. This concurs with findings of the Norwegian animal rights group, Network for Animal Freedom, which revealed that “assurance” farms lacked the necessary standards. It does not matter if the item only has fur trimming or is a full size fur coat, the suffering for all animals on fur farms is the same. Even if the OA™ label is what it claims to be, there is no such thing as a humane fur farm. Please, if you haven’t yet, sign my petition to Investec Ltd. the landlord of Erich Fischer Furriers. Non South African signatures add to the impact of this petition. Click on the link below to go to the petition.